Would you look at that! A list of sixteen silversmiths, all living and creating their works of art right here in Devonport. There may have been more than this, but these are the ones I have records of. Sixteen silversmiths! Perhaps that statement alone will give readers a feel for the status of Plymouth Dock/Devonport during the 1800s. We've been described through history as a deprived area, riddled with slums and prostitutes, with drunken sailors falling out of our dockland pubs - yet there was clearly another side to Devonport in Georgian and Victorian times, a parallel Devonport, equally as true, that doesn't get praised enough. This list of sixteen Devonport silversmiths is testament to that other Devonport, where monogrammed silver dinner forks were used at the dining table, where beautiful fine quality silver cream jugs and silver sugar tongs were the fashion at tea times. Dockers and people in slums did not live like this. No, the class of buyers for silverware in the 1800s could not have been your average docker, beavering away in the Yard. Such labour force earned barely sufficient to live on, hence rioting in Fore Street when the price of bread was too costly. Families who bought silverware at that time must have had above average income, and, going by prints of the period, they were fashionable too - probably living in the large Georgian houses dotted around Devonport at the time, and not the slums so frequently described for this area. Maybe they lived in once-handsome Ker Street, or in the George Street terraces, where there was (still is) plenty of room for servants in either the attic or the below-ground floors, or in Stoke, once a classy suburb of Devonport. It follows that, with sixteen silversmiths working in the town, surely Devonport must have had plenty of residents of this stature, for silversmiths continued to create their wares here for at least 160 years. The earliest mentioned in the catalogue is William Welch, who began operating in Plymouth Dock in 1758. The last known silversmith mentioned is Charles Croydon, who made silverware here as recently as Edwardian times. In the image at right the item was made and hallmarked 1922 by another silversmith, but Croydon's imprint, as the retailer, shows he was still operating in Devonport in 1922. Studying local artifacts such as this can enrich us, they can reveal aspects of our history we'd never considered. 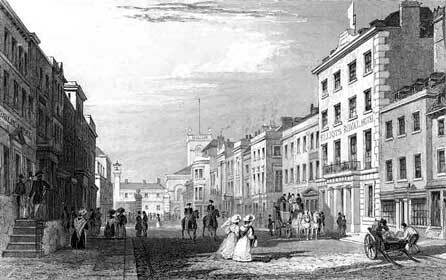 The print below, itself an early artifact, depicts gentlemen on horseback and elegant Devonport ladies in fashionable Fore Street, around 1832. Were these our silverware buyers?